I love this brush. I feel like it does a good job of distributing my hair's natural oils. I gets through any tangles very easily and with very little pain. I feel like this brush has done a great job of keeping my hair healthy and shiny. Nothing beats the original Mason Pearson brush, but this is ten times better with its price! I have two: one original (black) and the other in gold. I love that I can pack this in my purse or luggage and don't have to worry about it breaking! It also does a fantastic job with my unruly, frizzy long hair. If you put a shine spray on it and then brush it through your hair, it distributes the spr...read moreay beautifully. No worries about one part of your hair looking greasy because your brush deposited all of your shine serum on one part of your hair! 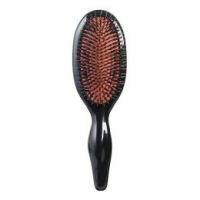 This brush has two types of bristles, both stiff but flexible and very fine, that gently grab hair, making it the perfect instrument to pull hair into a sleek ponytail or bun. It doesn't break my (fine) hair and adds a hint of shine when I wear my hair down.